What is prayer? I can tell you what prayer isn’t. It’s not reading about how to pray. It’s not writing in my journal about how I need to pray more. It’s not going to a church or settling into my private, personal space to get ready to pray. It’s not evaluating the best form of prayer: rosary? (no, too routine;) meditation? (no, too demanding;) Contemplation? (You’ve got to be kidding;) Prayer isn’t thinking about how helpful or necessary it is to pray. Prayer isn’t “guilting” myself into saying the words or reading Scripture. I think that this image with Merton’s words added is one of the most true, revealing, and impactful photographs I have ever seen. There are some things that simply click for me, and this is one of those things. 1. The hook is hanging somewhat passively, but it’s undeniably there. Whether the hook is lowered, or something is raised to it, the hook, God, is always there, and He always offers a way out, or up, or back, or down, depending on where we are when we open our eyes or reach out our hands. It took me a moment to think of God bringing us /down/ but maybe more often than we realize, especially in the West, that’s the direction we need more than any. 2. The cable supporting the hook can only invite. Were the hook attached to a rod or directly to a crane, the hook could be manipulated and pushed or forced into a space. As the hook is presented, it can hover near a space and even bob up and down to try to hook an object, but the efficiency offered by this design maximizes the ability of the target to evade the hook. It would be difficult to hook an inert object that didn’t have some kind loop easily to available. 3. The hook is solid and has obvious heft. Linking the hook to the cable is a thick coupler supporting the already thick hook itself. Many heavy things could be supported by this combination of tools. Certainly, the hook could life much more weight than one man or even several men could left on their own. 4. The hook is a versatile piece of equipment. 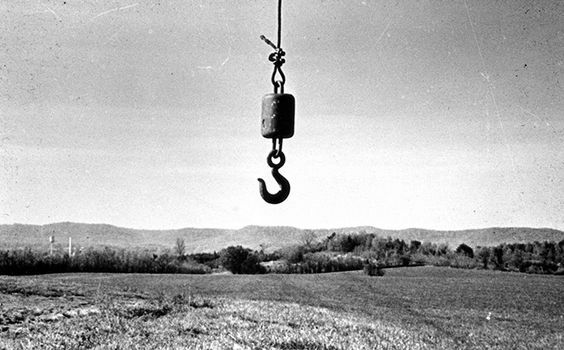 The hook can snag a cable or an odd loop of something and hoist it to someplace else altogether, or it can lift it up and set it back down from where it originated. There’s no need to have a specific apparatus to snag the hook. Give the hook a bit of room to slide in behind a solid piece of binding or an available opening, and the hook will use the laws of nature do the rest. 5. The hook will not hurt you. This hook will not impale or penetrate, like a fishing hook does. Of course, if you run headlong into the hook as it hands there, you will get your bell rung, and it you hit it hard enough, the hook may even swing back with the momentum you provided, and give you another reminder that it’s there, and that it’s more durable than you. So this image of God tells me all I need to know about God, but much less than I want to know.